The scope of what an advisor does is mind boggling. Essentially, they are small business owners with an endless list of responsibilities and clients who have unbelievably high expectations. It is impossible to accomplish all of the daily tasks alone and do them well, but advisors are almost forced to do so because clients and regulators expect this of them. So how can an advisor stay on top of everything while maintaining a healthy balance in their lives? We encourage advisors to embrace insourcing, as opposed to outsourcing. Outsourcing has a stigma attached to it that the buck is being passed to someone else instead of the advisor maintaining the responsibility themselves. Many people look at this in a negative light. Outsourcing is seen as just getting things off your plate. Insourcing, on the other hand, is keeping it on your plate, but not managing it yourself. The key is for advisors to offload the work, but maintain control and responsibility over the deliverables to the client. By delegating certain tasks to someone else, they can focus on their core responsibilities such as investment management and financial planning. Instead of hiring someone to come into a firm or farming it out completely, advisors are able to have other professionals to work with directly. Rather than sending clients out, the firm is bringing professionals in, almost like a board of advisors. Advisors should look at themselves as the client’s Chief Operating Officer - someone who oversees the aspects of their plan and the professionals who manage each “department." The advisor is ultimately responsible for managing the account and reporting back to the CEO, in this case, the client. Ultimately everything falls on the advisor’s plate, but they shouldn't be the one doing the minute details, every single day. 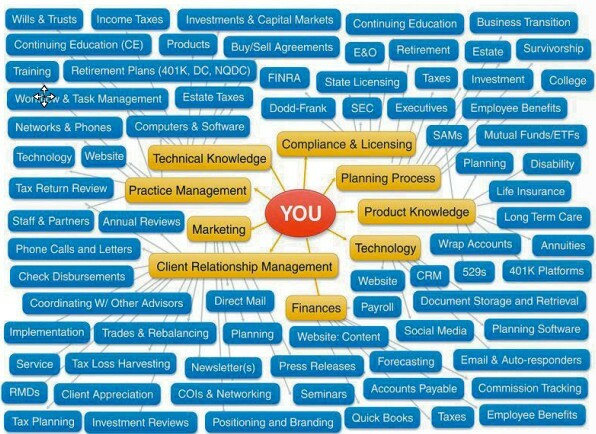 As the COO, hire and oversee a department manager for each one of those categories. How much responsibility is sitting on your plate? Do you think it’s time to create a hierarchy and start to in-source as much as possible?